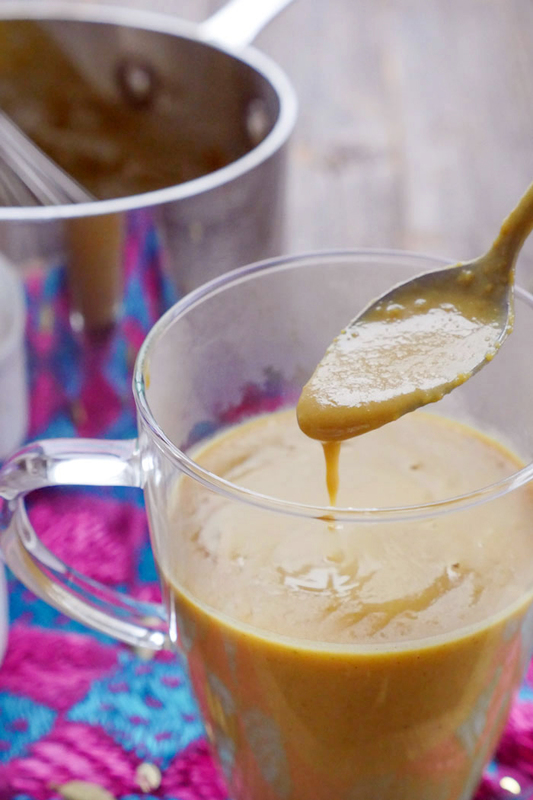 This recipe is both a dessert and a natural cold and cough remedy. Talk about tasty medicine, you guys. 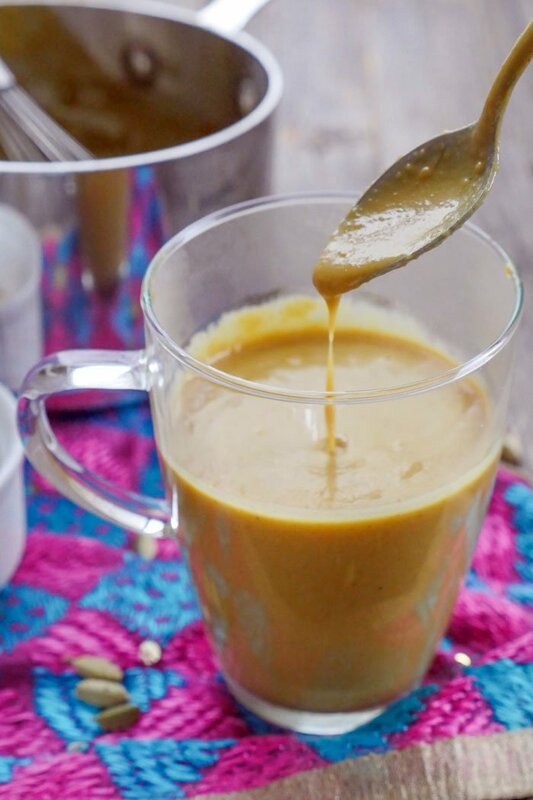 If you’ve never heard of Besan ka Sheera, it’s a sweet Indian drink made with ghee, besan (or chickpea flour), milk of your choice, sugar and spices. It’s a drink that’s often given to young kids and adults when they’re feeling under the weather. You’re supposed to drink it at night, before bed – and it’s supposed to be served hot. Please know – I’m in no way a doctor – these are just things that I’ve been taught by my parents who were taught by their parents. I have to ask. Did you pause for a second when I told you there was chickpea flour in this drink? I know that sounds like a strange ingredient to use in a dessert, but it’s actually very common when it comes to Indian sweets. When you roast chickpea flour, especially in ghee, it gives the flour a delicious, nutty flavor which works extremely well in desserts. In fact, some of my favorite Indian sweets are made with this type of flour (if you want to see more chickpea flour desserts, leave a comment to let me know and if there’s enough interest, I’ll add them to the blog)! Chickpea flour actually does something really cool to this drink. It helps thicken it, a lot. When you pour milk into the pot, the chickpea flour absorbs a lot of it – so you can make this drink as thick or as thin as you’d like by adjusting the amount of liquid that you add to it. Cold season has hit our little family hard. First my husband got sick. Then my poor little baby got his first cold. I’ve been feeling sick for about a week now, but I’m pretty sure I’ve somehow willed myself to be okay so that I can take care of my boys. Now that they’re better though, I’m losing to the cold – losing bad. Before I resort to the medicine cabinet though, I prefer to first try natural remedies. 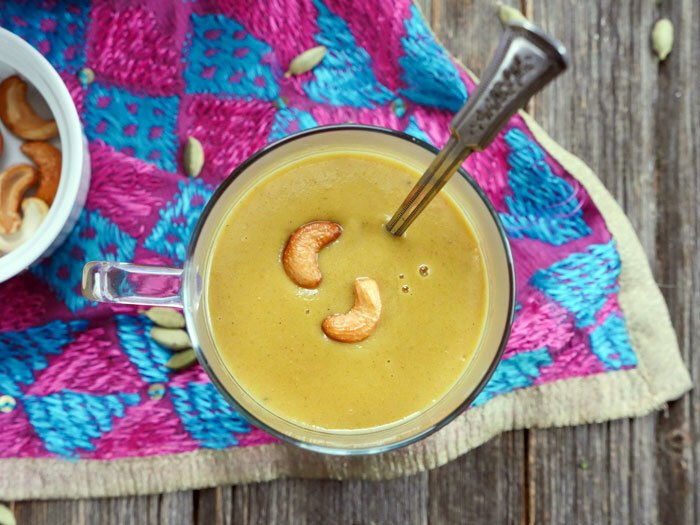 There are several things I like to do: drink this besan ka sheera, drink turmeric milk or eat golden milk gummies. I’m not sure if this is true or not, but it’s said that the benefits of besan ka sheera can help even a nursing baby. I have no idea if this drink helped my son get better or if the cold just ran its course. But I have to tell you – I felt so helpless while my little babe was sick and drinking this drink made ME feel better. Like I was doing something to help. I’m pretty sure that this is by far the best cold “medicine” you’ll ever have. The great thing about this recipe is that even if it doesn’t help you feel better, it still tastes delicious. 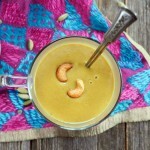 You can top it with cashews cooked in a bit of ghee to make it more dessert-like. Melt the ghee in a small pot, then add chickpea flour and stir the two together until the chickpea flour becomes dark yellow/golden in color and gives off a nutty aroma. Stir in the spices, then add the milk and sweetener. Mix well. Once the milk is hot, turn off the heat. This drink is best served hot and before bed. If you prefer a thinner consistency, you can add more milk. You can use Indian besan flour (desi chana flour) or chickpea flour in this dish – both work, though besan will have a nuttier flavor. I’d love more chickpea flour dessert recipes! Being paleo, I don’t think flour made from chick peas would be acceptable. Can you substitute it, or is it the main ingredient for the flavour and getting over the cold? Thanks. I just tried this. I’m not sick though, just disgruntled and I wanted something creamy. I really enjoyed it- it made me think of drinking vanilla wafers. My mom tasted it and said it reminded her of egg custard. I used a mix of coconut cream and water for the liquid, and sweetened it with maple syrup- definitely will make this again. 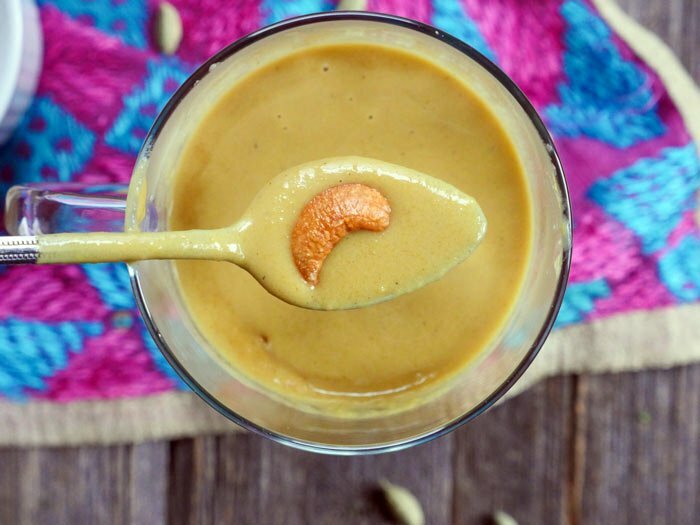 Yes please, more besan recipes! Ooh that rhymes a bit. Yes please Ashley, more chickpea flour recipes please 🙂 Many thanks!! Just to make sure – is sugar amount correct in the recipe? It seems to be extremely sweet? Otherwise looks great. Hi, it says to taste – so you can add a little at first if you’d like then adjust it to your taste! Hope that helps! Thanks! I made one yesterday and added half of that amount – it was still much too sweet for me (I don’t use much sugar in the kitchen), but otherwise it was delicious :-)! And EXTREMELY worming! That would made perfect evening drink for winter after some outdoor activities. But in the summer works as well when you feel like getting a cold :-). I have added quite a big chunk of fresh turmeric as it happened I had one in the fridge. I guess you could add honey if not vegan, which is known as cold remedy as well. Thank you for sharing this great idea. 🙂 Yess!! I grew up on this cold/cough remedy. Always worked /works wonders for me! I don’t use sugar and prefer a much more milkier version. Thanks for sharing!! This is….what i was searching from a long time. Thanks Ashley for this nice dish. You’ll just need to whisk it more to remove any lumps – you can also add more milk if needed. Thanks, Anisha 🙂 Hope you feel better soon! So yum! Love besan anything. Lol! How often should the drink be consumed? I’m sure there no harm if let’s say a week.? Vagisha, I’m so happy to hear that!! Love the idea of adding some ginger powder – will have to do that from now on!